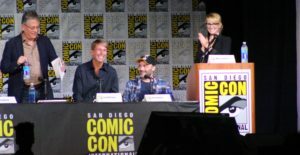 For a show that has been running for nine years, entering into it’s 10th season, and what fans despair will be the last, The Big Bang Theory panel certainly electrified a room of fearful fans. With witty commentary from moderator and show star, Melissa Rauch (who plays Bernadette Rostenkowski-Wolowitz), to stories of inside jokes amongst the writers, it was easy to tell that the past years have created a family for the cast and crew, increasing an understanding of why the show continues to succeed in ratings and passion. Often times art mirrors life, and in the case of The Big Bang Theory, it appears the writers often utilize real moments from their world, and insert them into situations for the gang of The Big Bang. Relatively new writer, Jeremy Howe, explained how his wife often forgets his birthday, stating that she can only remember “that it is one of two dates, 20th or 21st”. This experience inspired the story of Johnny Galecki’s character, Leonard, learning that Penny, played by Kaley Cuoco, had forgotten his birthday; vital information needed in order to get into Leonard’s iPad. Jack McBrayer joins the cast of The Big Bang Theory. Co-executive producer and writer, Saladin K. Patterson, stated that after buying his family activity trackers which allows an individual to monitor, and even challenge a friend’s steps, as a motivator to keep his family healthy, the kind gesture quickly turned into passion towards defeating his wife in FitBit challenges. As expected, this real world experience made it into the show as a kind hearted gesture gone ary, from Bernadette to her husband Howard, portrayed by Simon Helberg. Quirky stories of gags in the actors room, including a hilarious bit about executive producer and co-creator Bill Prady wearing a picture of a snake in his shoes for 18 months, to the sorting of Hogwarts Houses for cast and crew, to even the show star Melissa Rauch stating that her parents were given free bagel and cream cheese as SPOILER ALERT a congratulations for her character’s cliffhanger of a pregnancy announcement, filled the room. Of course, in Comic Con fashion, the crowd was also rewarded with the biggest news to come from the writers room, an introduction to Penny’s family. The 9th season ended with Leonard’s father, and now the 10th season will open with Penny’s mother and brother. Sons of Anarchy and Married With Children star, Katey Sagal, will be playing the role of Penny’s mother. It should be noted that the two actresses have already worked together on 8 Simple Rules, where she also played Kaley’s mother, a mother daughter pairing that proved strong with witty banter. Stressed out and neurotic, this mother often feels cursed by her recently released from jail son. Veteran producer and writer, Steve Molaro stated that “We needed to find the right person to get for this [role],” he said of Penny’s brother, adding “I think we did a pretty good job on the casting. He’s a little scary.” Out walks onto stage but none other than the iconic smile and quirky demeanor of Jack McBrayer, star of 30 Rock. This hilarious and ironic casting for a drug dealer is sure to create many laughs, all of which can be expected to premiere on September 19, 2016.